Cattle are large domesticated animals reared for beef or leather or kept to produce milk. The word cattle has no singular form, as the male bull and the female cow have markedly different temperaments. However, cattle are often referred to as "cows", whether male or female. The offspring of cattle is a calf (plural calves). A castrated bull is called a bullock. The female appears placid and contented and can be easily approached and milked, even by a child. 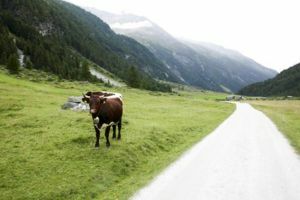 The bull is considered dangerous and is typically penned up far away from any cows. Like many kinds of livestock their waste produces methane, an invisible and odorless gas, which liberals falsely maintain contributes to global warming. There are over 60 breeds of cattle worldwide, including the Brahmin, Zebu, and Hereford. Uniformitarian thinkers claim cattle were domesticated by mankind over thousands of years  but Christian believers prefer to argue that these creatures were created by God as they are today for the benefit of mankind. This page was last modified on 23 June 2016, at 22:28. This page has been accessed 49,970 times.